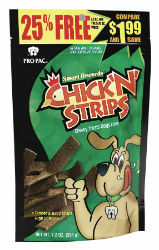 Dogs crave these chewy treats! Your dog loves the taste of real chicken, and it's in every scrumptious bite of PRO PAC® Chick'N'Strips. They look like real jerky and taste so good, your dog will come running when you rip open the package!